This is Part III in a four-part Q&A Series on the future of digital healthcare. You can read Part I: Mobile Endpoints here and Part II: Health Data here. If you’d like to contribute to any of these discussions, we’d love to hear from you in the comments section. How do you build a healthcare app? In earlier days of the Internet, developers had to spend their time building out basic functionality like search or payment rails. Now with the likes of Stripe for payments and Algolia for real-time search, you can add these services to your app via modern, reliable, and easy-to-use libraries and APIs. However, developers of healthcare apps don’t have the same kind of tools and community yet, at least for the U.S. market. Want to bill a patient? You can’t just send off a bill to their phone. First you need to check eligibility with their insurance provider and respond to claims from the provider, along with many other issues that make healthcare billing so complicated. And much of that is either running off a data schema called X12, developed in the late 1970’s, or a smattering of proprietary, developer-unfriendly APIs. We are beginning to see some companies emerge to supply developers with the modern tools they need to build healthcare apps. For instance, Eligible and PokitDok provide APIs for checking patients’ eligibility and processing payments; TrueVault and Aptible offer HIPAA-compliant database-as-a-service; and Human API, Validic, and Akido enable access to patients’ health data. Open mHealth, developers of Shimmer (an app for reading health data from third-party APIs) and Granola (a healthy serialization library for your Apple HealthKit data), provides a free, open source framework for accessing digital health data. We anticipate more entrants in this market, particularly as more of our health records move online. How will the medical app market evolve: Will we see unique specialty apps per ailment or big all-encompassing apps? Most of today’s consumer-facing healthcare apps are general-purpose diagnostic experiences. For example, a patient opens an app like Doctor On Demand or Teladoc, shares his/her symptoms with a doctor, and then is either prescribed a treatment plan or gets a recommendation to visit a doctor’s office for further care. At the same time, there are also apps that focus on a single medical specialty. Klara and Spruce, for example, enable dermatologists to treat their patients via skin selfies. Maven focuses specifically on women’s health. In a sense, specialization by app mirrors the way services are organized on our phones: there’s an app for photos, one for messaging, one for music, and so on. Just as you can go deeper with photo services when it’s contained in a dedicated photo app experience, you can go deeper treating a skin condition in an app dedicated to skin care. As investors, we’re particularly eager to see whether there will be one dominant company that builds multiple apps across practices (“app constellations”, if you will) or if we’ll see many different companies succeed with their own verticalized apps. What does the next WebMD look like? One of the amazing things that the Internet has given us is the ability for people all over the world to collaborate and create huge repositories of information. 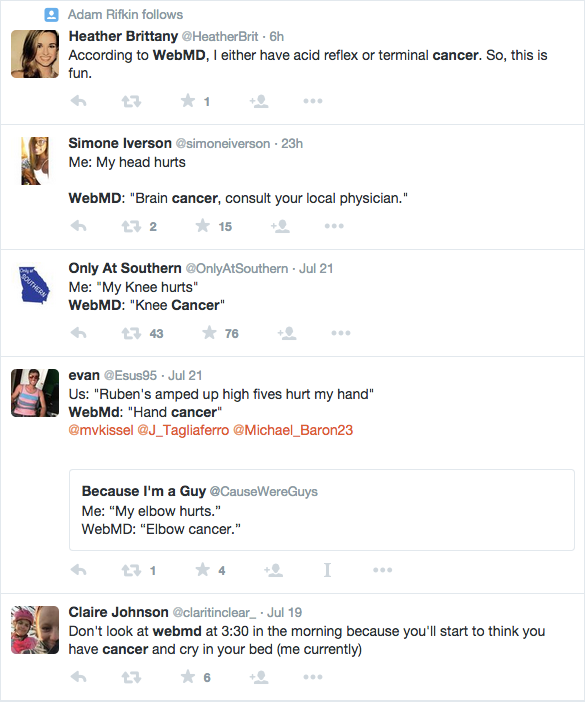 In medicine, WebMD has been the primary destination for health news, advice and expertise, but it has not aged well. We believe that there will be a people-powered repository of medical information. But unlike WebMD, it won’t be driven by content writers. Instead it will more likely resemble StackOverflow, driven by passionate, deeply expert members of the medical community. USV and Version One are already investors in one such medical information-sharing network, Figure 1. Just as software engineers and developers share programming knowledge, Figure 1 enables doctors, nurses, researchers, and first responders to share medical cases around the world. CrowdMed is another example. It connects patients with "medical detectives" (which may be doctors, medical students, or even laypeople) with the goal of helping people solve their undiagnosed medical "mysteries". And communities like PatientsLikeMe, Crohnology and Kinsights enable patients/parents to share advice on specific medical issues and medical medications. Much as a programmer will often find his or her question already answered on StackOverflow, the trail of content left behind in these networks could be a boon for those who want immediate answers to their healthcare questions. We’re also interested to see how Google and IBM Watson leverage these networks of people and information with machine learning. HumanDx, also a USV investment, enables the medical community to collectively contribute knowledge to an open machine learning system that could benefit people everywhere.